Mark and I always talked of getting kayaks for our place in Vancouver. After all, we are right on the beach! That was when at least one of us was working. Should we get singles? Doubles? Wouldn’t it be great to walk our kayaks across the street and put in right there? Well yesterday, we did just that, thanks to our wonderful friends Keith Miller and Tammy Borichevsky of California Canoe & Kayak who gave us two kayaks (sized to fit the 14′ U-Haul truck), spray skirts and paddles the day before we drove to Vancouver. Keith and Tammy have been great supporters of our service projects over the last few years, but they have been involved in environmental protection and community service for more than 30 years. They were fixtures at Friends of the River conferences, helped raise over $185,000 to date to fight breast cancer with annual Support Strokes events, and provide internships and other opportunities for low-income youth in Oakland. 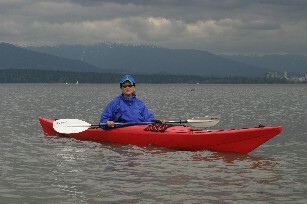 It was beautiful on the water despite the fact that my stroke isn’t even (I need a rudder!) and I’m using too much arm (oh yeah – I feel those muscles today). And wouldn’t you know it, the wind picked up on our return and it was not at my back.